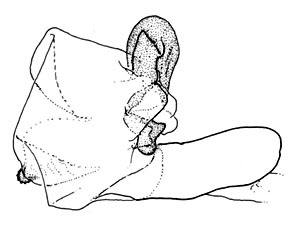 Xylina dentilinea Smith, 1899, Jour. New York Ent. Soc., 7:229. Cucullia dentilinea form mexicana Draudt, 1924, in Seitz, Gross Schmettterlinge der Erde, 7:174. Diagnosis: Dolocucullia dentilinea is a hard species to characterize because of its obscure appearance. It is gray with elongate, but not pointed, forewings and strongly lashed eyes. The hindwing is suffused with gray brown. 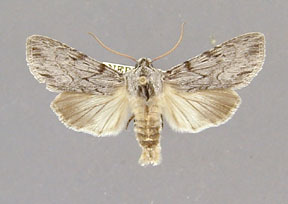 In contrast the hindwings of Dolocucullia minor are usually pure white (males), or with only a dark outer margin (females). The male clasper is forked in dentilinea but single in minor. Wing length from base to apex: mean = 16.84 mm., standard deviation = 0.48 mm., n = 10. 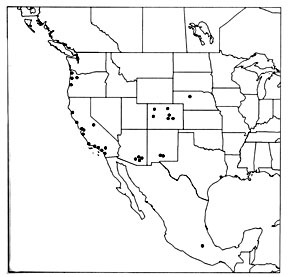 Distribution: Dolocucullia dentilinea occurs in California, particularly in the San Francisco Bay area, and has been taken as far south as the Los Angeles area. It has been collected in Oregon, middle Colorado, southern Arizona, and southern New Mexico. The species is fairly common in the prairie regions of Nebraska. The species occurs in Mexico as far south as Mexico City. 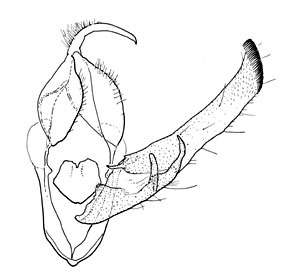 Dolocucullia dentilinea appears to have a very patchy distribution. Significant geographical variation is present in this species. Specimens from Oregon and the San Francisco Bay area of California are more brightly marked than those from other localities. There are also differences in the male genitalia. The valve of California specimens is narrower and the corona not as well developed as in material from Colorado and Arizona. There are small differences in the shape of the clasper. I was, at first, inclined to think two species might be involved. 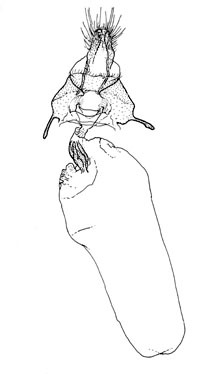 However a study of Central and South American species appears to indicate that the species of Dolocucullia are prone to geographical variation in the male genitalia. 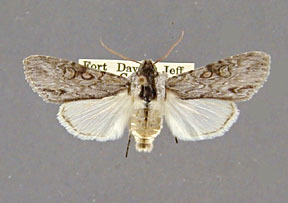 Most specimens have been collected in April, May, and June.